Loving the chair and the kitchen, especially the Eiffel tower print against the white walls. A well-done black and white palette feels timeless, classic, and elegant. Love the post. Hi Erica! Glad you're back! LOVE black and white, you can never go wrong with it! That Chanel tray is to. die. for. Oh me too... that first photo is fantastic!! 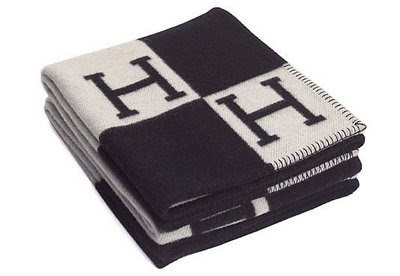 And I completely fell in Love with those Hermes blankets. I was just there this past weekend. It's like a museum! LOVE the kitchen image! So funny becuase I'm preparing a black and white post for next week. haha! Great minds think alike. Your blog is absolutely lovely! All of these photos have my pulse racing. So incredibly inspiring! 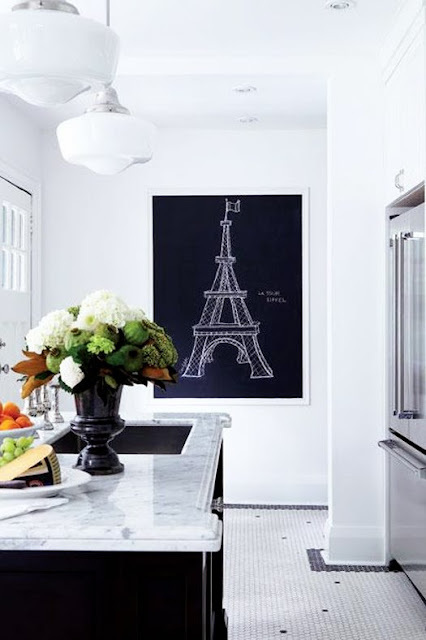 I love that kitchen so much and Im so obsessed with the Eiffel Tour painted on the chalkboard, genius! i do enjoy black and white, but it must have a pop of color or its a little cold in my mind. when color is involved (even just flowers) its fab!! Black and white is just such a classic combo. I love it. I really love that kitchen! I'm afraid of color, so of course I love it! Nothing says crisp & clean like black & white. As soon as my house gets its white on, I'm adding a B&W canvas awning over the patio... and loads of pink sunbrella floor pillows. Can't wait until it's all done! NOW YOU ARE TALKING! My favorite, and always will be - BLACK AND WHITE! black and white is always good. I love the black and white contrast. Don't believe me? Just look at my stairs! 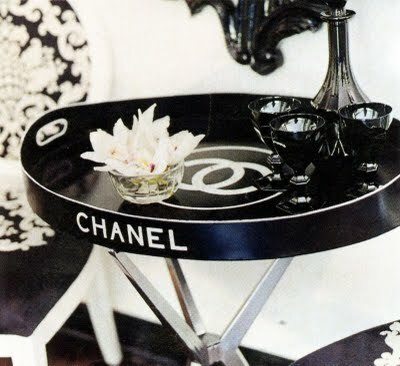 Loving that chair and of course the Chanel tray. You have such great taste, I'm really enjoying your blog! I have a black and white bedroom...so I'm certainly with you on this combination Erica! Watch out for a post on it soonish...from bland to bold..it really has made a huge difference even if putting the first black brushstroke on was really scary!! I LOVE the contrast of light/dark and that first image is amazing...it's perfection! I am loving the chair, not loving the price... bah! Just about to commit quite heavily to the "Black and White" in my new build, even though I've had many a comment to stay away from black......am quite obsessed with it at the moment, can't help what you love?! So good to come across your post and comments, quite reassuring that my styling (I'm no professional) is not too "way out"!! I am addicted to black and white at the moment. I actually need a black and white striped rug...stat! Oh yes, it is a classic combo for sure!! Love your blog!! How did you find me? I am glad you did, cause now I discovered you too! I need to figure out how people can follow me other than twitter... I am a wordpress blog, not a blogger so I think that makes a difference. Any ideas? I am loving all these images...looks great with your blog banner/header too! the joy of it all, is you can add or take away any random splashes of color.. for emphasis! Just found you after you left a comment on the Just Beachy blog. I can totally relate to your personal style. I also love contrast, it excited me! Thanks for stopping by and leaving such a sweet comment....LOVE your blog, and now am a happy follower! love your style...and LOVE that you have F.I.V.E. BOYS..what a wonderful gift! Look forward to getting to know you in blogland. Black and white always works. Such a great contrast. lovely pics! Hi Erica! Thanks for coming by my blog yesterday! It is so nice to connect with you! The first picture is so me! I love the Eiffel Tower print and the marble countertops....we have marble in our bathrooms, and I love it. I wish we had it in our kitchen, but we have a dark swirly granite....it's just a little too dark for me. This picture made me long to change it out ASAP! so well deserved! Black and white is a favorite of mine. Would love to add any of these pieces to my home. Now to go visit the money tree. Loving this post! And loving your blog! In awe that you have five boys and make it all look so effortless.